The University of Rhode Island ranked 160 out of 201 schools on U.S. News & World Report’s annual National University Rankings list, this year. Ivy League universities like Princeton and Harvard held the top spots on the chart, but what do the rankings really mean in respect to each school? Neighboring universities scored undeniably higher, with University of Massachusetts Amherst at No. 87, University of Connecticut at No. 58 and Boston University at No. 42. U.S. News ranked the universities off of 16 indicators of academic excellence, and then each school is assigned a weight. They are then ranked against their peers, based on their composite weighted score. The schools that do not use the SAT or ACT test scores are unranked and listed separately by category to be fair. This leaves a total Â of 201 schools, which are ranked in order based on seven indicators of academic quality, including characteristics such as faculty resources, financial resources and alumni giving. One key quality that URI has struggled with in past years is graduation rate performance, which accounts for 7.5 percent of the ranking. The Vice Provost for Enrollment Management Dean Libutti explained how URI is actually working towards increasing the graduation rate. Over the past 10 years, URI’s expected graduation rate for a four year program for first year students has increased by 24 percent. Incoming freshman in 2013 received t-shirts that stated “Start in 2013. Take 15. Finish in 4.” Libutti expressed how this shirt had a greater impact than it may seem, because the university is working strongly towards a structured four year plan for all majors. URI pulled it’s weight again when Princeton Review named the university as one of the nation’s top “green” college for the fifth straight year. 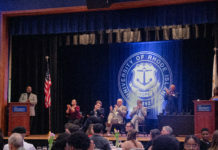 Out of 99 points, URI received 95, beating both competitor schools in the state, Roger Williams and Brown Universities. Jumping three points higher than last year, the university was noted for its energy-efficient building, Hillside Hall, its commitment to organic and local food in the dining halls, and its numerous green student groups around campus. URI was also recently recognized as one of the top 50 LGBTQ-friendly universities in the country. The Campus Pride ranking rates schools out of five stars, accounting for LGBT inclusion policies, including support and institutional commitment, student life, housing and residential life and campus safety. URI received a five out of five star overall rating. Libutti is “pleased to see URI has positive rankings,” and explained how these authentic rankings will only benefit prospective students, and their feelings about coming to URI. This year is said to be the highest increase of incoming applications and freshman class in the school’s history. According to Enrollment Services, there is also a record number of students that have attained internships and jobs after graduating.